The generic name Diospyros means ‘divine pear’, and the specific name mespiliformis is derived from two words,‘mesos’ meaning half, and ‘pilos’, which is bullets. Belongs to a family Ebenaceae. Diospyros mespiliformis is a tall, deciduous tree which usually attains heights of between 15-25 m, with dense, rounded and buttressed stem. It can however reach 45 – 50 meters height under optimum conditions. The bark is grey-black or black, smooth in young trees but rough with small regular scales in older trees, pinkish when slashed. Young branchlets are green. The crown is very branchy with dense foliage. Leaves are alternate, shiny-green above, paler beneath, 4-7 cm long. The fruit is a fleshy berry,with enlarged calyx, yellow to orange when ripe. mespiliformis is dioecious and pollinated by bees. Flowering takes place in the rainy season (October to November) and fruit ripening, which coincides with the dry season takes place 6-8 months after flower fertilization. In southern Africa, flowering occurs from October to November and fruiting from April to September. This tree is involved in a unique ecosystem. Different insects such as bees and wasps play a role in pollinating the flowers. Seeds are dispersed either through wash-off by rain or in the droppings of animals that feed on the fruits. 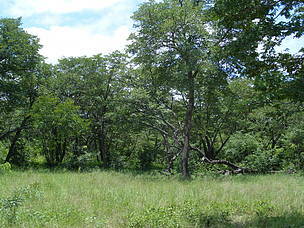 The species occurs in woodlands, savannahs and along riverbanks. It prefers areas with permanent water that helps in natural regeneration, and it grows faster in frost-free areas. It favours heavy soils on riverbanks but also occurs in open woodland and is commonly found on termite mounds. A secondary benefit from this tree is the flavour it gives to termites nesting around the tree. The termites feed on the roots and humans eat the termites, including flying termites, which are delicious. It is one of the savanna giants that can live for more than 200 years. This is a protected tree in Zimbabwe. Altitude: 350-1250 m; Mean annual temperature: 16-27 0C. ; Mean annual rainfall: 500-1 270 mm. Tree mostly found in Savannahs of Africa. Zimbabwe, Zambia, South Africa, Swaziland, Namibia, Angola, Botswana, Eritrea, Ethiopia, Guinea, Kenya, Nigeria, Sudan, Tanzania, Uganda, and Yemen. In Zimbabwe, it is found in all the five Agro-ecological zones (I to V). The bark produces a dark-coloured gum which can be used in broken pottery. The bark is also used for dyeing mats red. Fruit pulp is applied as varnish to pottery. The juvenile twigs are sometimes used as toothbrushes. The wood is used for black-wood cabinetry, furniture, carpentry, heavy flooring, interior trim, ship building, vehicle bodies, musical instruments precision equipment, turnery, carvings, knife-handles, yokes and brush backs. Food: The edible fruit is used fresh in fermented drink or dried and stored for later use. It can also be made into a type of porridge or more commonly mixed in with mealie meal. 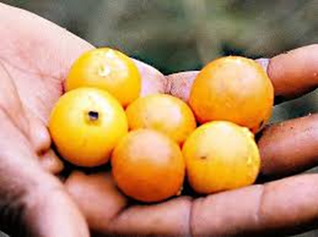 A traditional food plant in Africa, this fruit has potential to improve nutrition, boost food security, foster rural development and support sustainable landcare. The fruit are sometimes preserved, can be dried and ground into a flour, and are often used for brewing beer and brandy. Fodder: Leaves are eaten by elephant, giraffe, buffalo, black rhino, eland and kudu, while fruits are eaten by kudu, klipspringer, warthog, baboons, vervet monkeys, yellow spotted rock dassies, pigeons, parrots, hornbills, louries and bulbuls; a definite asset to any farm. Apiculture: It provides very good bee forage. Fuel: D. mespiliformis makes good fuelwood and charcoal. Timber: Wood with a light coloured sapwood, and a dark brown, fine grained, hard and heavy (air-dry 850 kg/cubic metre) heartwood. It is hard, strong, fungi and termite resistant and is used for construction purposes, furniture, carvings, floors, stamping blocks, pestles and walking sticks. Dugout canoes are made from this wood especially in Botswana and Namibia. 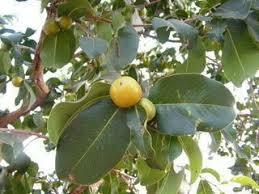 Medicine: The leaves, roots, bark and fruits contain antibiotic qualities and have many medicinal uses. Roots and bark are used to stop purging and to enhance fertility, while the leaf decoction is used as remedy for fever, otitis and wound dressing. A decoction of roots is ingested to get rid of internal parasites such as worms. Bark and roots are also used to treat infections such as malaria, pneumonia, leprosy, dermatomycoses, as an anthelmintic and to facilitate child birth. Ornamental: The large trees have a non-aggressive root system and are suitable for very large gardens and farm gardens. Seed – pre-soak overnight by immersing the seed in hot water which is allowed to cool in order to break dormancy. They should be sown in flat seed trays filled with river sand. Under ideal conditions seeds germinate within 50 days. Seedlings are then planted out when they reach the 3-leaf stage because if left longer, the taproot may be damaged when transplanting. They are rather slow growing initially but the growth rate speeds up considerably after a year. Young trees do not transplant easily. Seed storage behaviour is orthodox. Viability can be maintained for one season in open storage, but can be maintained for several years in hermetic storage at 3 0C with 5-6% moisture content. Root suckers can be used for propagation. Slashing and weeding should be practiced until the trees are well established. Protection from fires helps improve crop stocking in natural forests, and trees should be sheltered in cold areas. The tree can be coppiced. Seeds are attacked by seed borers. Sawdust of this species, causes dermatitis after continuous contact. The Forestry Commission is a parastatal under the Ministry of Environment, Water and Climate.It contributes to national socio-economic development through regulation and capacity enhancement in the utilization and management of forest resources.